We are very appreciative of your generosity and delighted to announce this total of the donations received for ‘Give peas a chance‘. 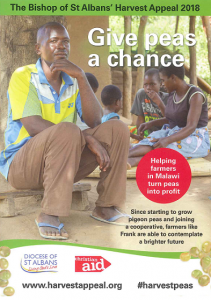 The lives of many, many people in southern Malawi will be transformed with the amount given, by being able to grow and sell this hardy, drought-resistant crop – the remarkable Pigeon Pea. At Church Farm Ardeley, primary school pupils were invited to share in an agricultural farming experience. The event was hosted by The Ven. Paul Hughes, Archdeacon of Bedford, with special guest, Kate Ormerod from Christian Aid, who had returned from Malawi, where she had met Frank Zulu and his family (poster image).